AURA MiniTM Cabinets are supplied in one compact size only (895mm ). 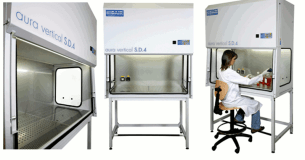 These state of the art compact down-flow cabinets, provide an ultimate cleanliness Class 100 work area where the highest safety for the products is achieved. AURA VERTICAL SD4 with sliding sash and exhaust HEPA filter.